Wedding | Dessert Darling is featuring my wedding at 12pm Pacific time! WOW!!!!!! I’m so incredibly honored that I’m beside myself! 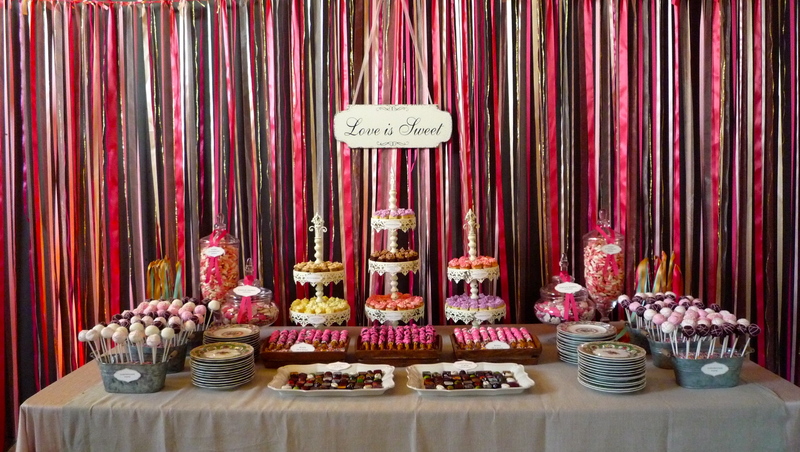 In light of this feature, I’m posting a recap of my Wedding Dessert Table below. 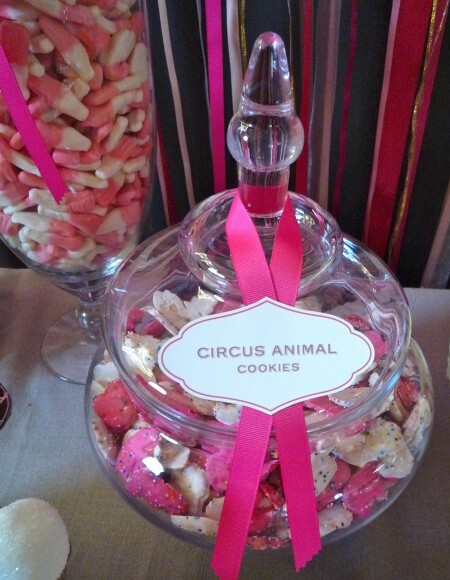 Circus Animal Cookies for nostalgic’s sake.. and the pink and white colors! (more here)! 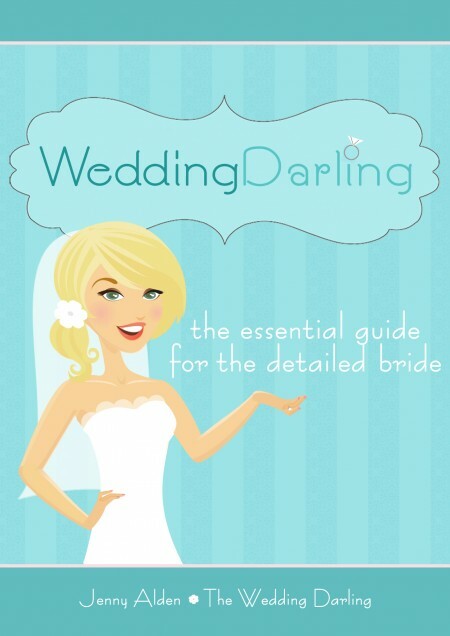 I wrote an EBOOK on Wedding Planning! For your i-pad: download the Free Nook app onto your iPad here and purchase the book here. In addition to all of the fabulous baked goodies that you’ve been reading about these last few days, I had to throw in some store-bought treats to round out my dessert table for good measure. Mother’s Circus Animals are not only a childhood favorite, but also they were aesthetically perfect with their pink and white colors and joyful rainbow dots. The Strawberry Milkshake Gummy Bottles that you see there on the left were a last minute addition that I threw in because a few friends were claiming that they love gummy candy. Trying to find gummy candy in the correct shades of pink and white proved nearly impossible, until I finally stumbled upon these milkshake bottles. Not many people tried them and the ones who did gave mixed reviews. Well, that about rounds up the dessert table! 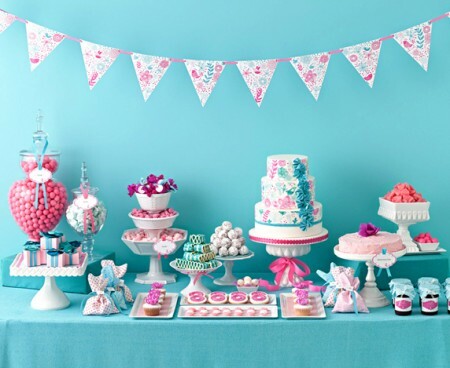 But believe it or not, we had even more goodies than what you see at the Dessert Table! Alas, I’ve now written 6 posts into the wee hours of the night and I haven’t event packed for my honeymoon to Thailand yet! Yikes! I hope that you enjoyed reading about the Dessert Table goodies and I’ll catch you up on the last sweet touches when I get home! 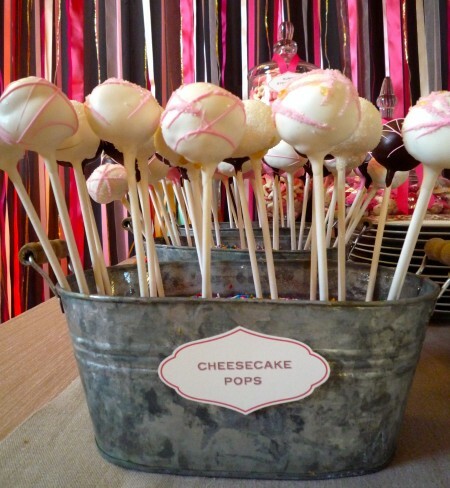 A cursory glance of Sweet Lauren’s blog will quickly reveal the most darling Cake Pops that you have ever seen. These ladies are PROS who clearly care dearly about every fastidious detail of each delightful pop. Wow! I was so happy to find not only adorable Cake Pops in Northern California, but also a company that would make Cheesecake Pops, as these seemed rather impossible to track down. Lauren went so far as to create a new recipe so that my wildest wedding fantasies could come to true. I needed Cheesecake Pops, verses regular Cake Pops, because I didn’t want to have a treat that would be redundant with the Swizzle Cakes. Furthermore, the slightly salty, sour touch of the cheesecake would be a nice contrast to the other, simply sweet selections. At the end of the day, Sweet Lauren Cakes nailed it. 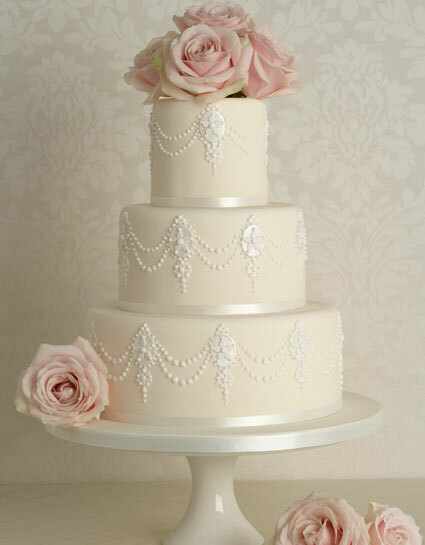 For more information on Sweet Lauren Cakes, click here. Just look at how gorgeous these chocolates are! I sampled them before the wedding in a desperate hunt to find delicious N.Cal chocolates to feature at my dessert station. Christopher Elbow’s delights earned this review of praise here. I added this chocolate addition to the dessert table for obvious reasons. People love Chocolate! 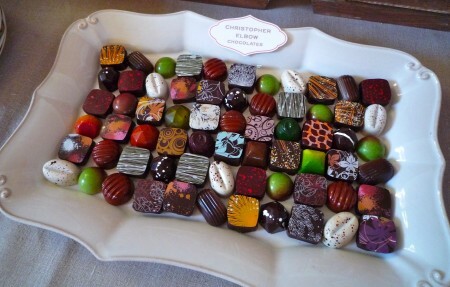 And I love Christopher Elbow’s Artisanal Chocolates! 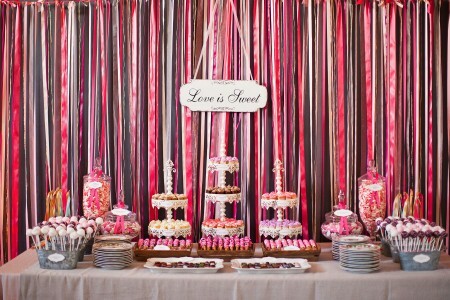 Another strategic move for the dessert table was to serve manageable, bite-sized treats that people could delight in, even after an evening replete with appetizers, plated dinners, and alcohol. Tiny, “shot-glass” sized Swizzle Cakes were a no-brainer for me, as you may recall my glowing Golden Cherry review of them here. We had Lemon Drop Martinis, Cosmos, and White Russians for the big boys, and non-alcoholic Shirley Temples and Chocolate Cola for the kiddos. To see my video on Swizzle Cakes and learn more about them, click here! As you can imagine, I put a tremendous amount of thought into my dessert station and was rather strategic about my selections. I chose these Bears on a Stick by the Rocky Mountain Chocolate Factory because I know that many people prefer salty items to sweet ones when they are drinking. Voila- these awesome pretzel rods, dipped in caramel, rolled in peanuts, and drizzled in chocolate were the perfect choice. Everyone who had one was raving about these multi-texutred, sweet and salty goodies. I knew they would be tasty, but I had no idea how huge a hit they would actually be! Wow- glad I got those! To see my video on the Rocky Mountain Chocolate Factory, click here. To see more info about the Rocky Mountain Chocolate Factory, click here. As you read this post I am probably on a plane, finally nearing my honeymoon destination, Thailand! I’ve never been to Asia and am quite eager to see what desserts are in store for me there. But enough about what I haven’t had yet- Let’s talk wedding desserts! I couldn’t possibly leave you hanging until my return, so for today, here is a snapshot glimpse. 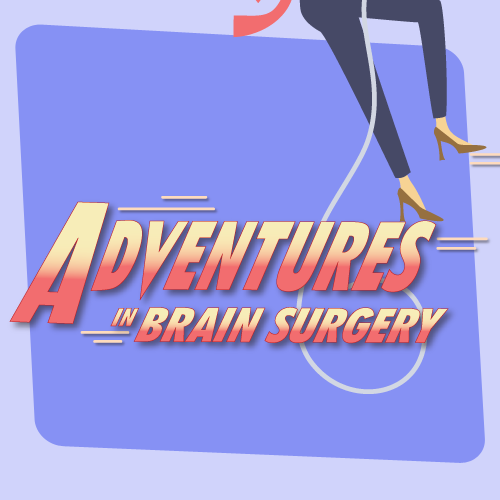 Tune in the next couple of days to see what each fabulous selection was all about! 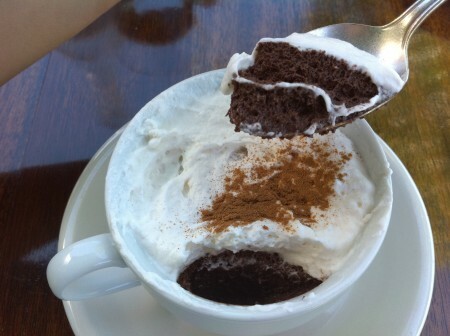 Thank you Autumn Reeser for taking all of the upcoming shots of my desserts! Be sure to check out her blog, MoveLifeStyle.com! ps: I feel compelled to share that the wall was a dark slate color which is why it looks like we have black ribbons. Ewe, no. Probably should have put a white sheet behind those fabulous ribbons! Happy Monday! A few months ago I did this poll on wedding desserts in general. Now I need to know, specifically, what kind of cake would excite you the most? The given is vanilla buttercream frosting since cream cheese frosting doesn’t hold up as well and chocolate isn’t as pretty. Thanks guys! If you have any thoughts on the filling or other suggestions, feel free to comment below! 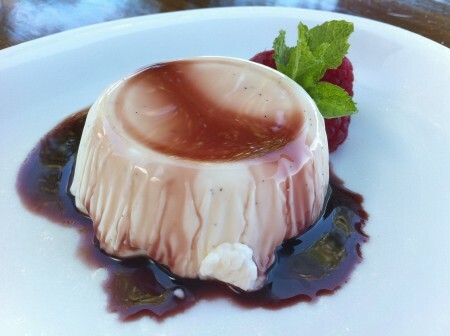 I ordered this seamlessly smooth, Vanilla Bean Panna Cotta, that was topped with an enchanting Red Wine-Balsamic sauce. I’m not going to lie, I was a little preoccupied with our music-playlist discussion to fully analyze the desserts (NO Disco music!!! ), but I did lick both plates spotlessly clean. SO, 5-cherries for a glorious lunch and delicious desserts! For more information on Rustic restaurant at Francis Ford Coppola’s Winery, click here. Wedding season is in full swing! In fact, I have a wedding every fabulous weekend of May! As I attend all of these beautiful celebrations, the wheels in my head are spinning about my upcoming nuptials in September. What desserts should we have?! 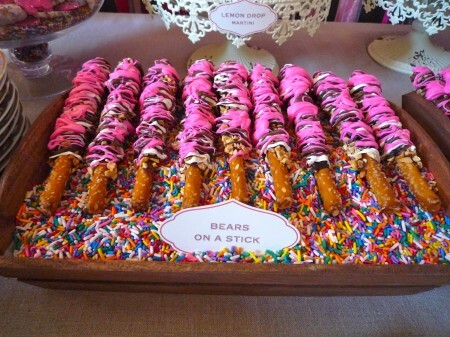 The crazy thing is, as much as I Love desserts, I rarely eat them at weddings! After so many appetizers, dinner courses, and a little libations, I’m more ready to Dance than eat more! Alas, a DD’s gotta have good amount of desserts at her wedding. So I ask You. 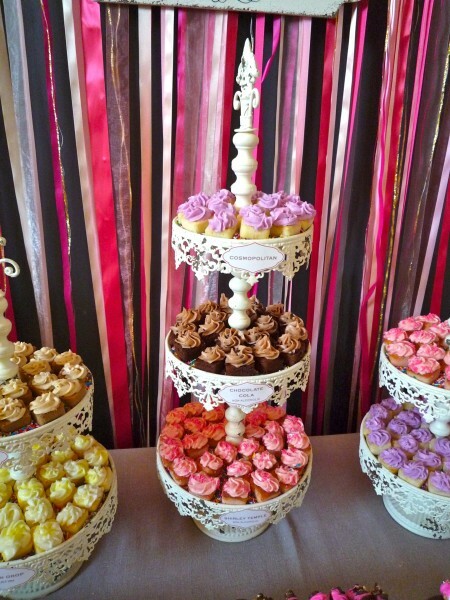 What desserts would excite you most at a wedding?